Experience a culinary masterpiece at Alba, JW Marriott, Bangalore. Italian cuisine has evidently taken a center stage amongst the global cuisines in my opinion. Tryst with Italian cuisine in the weekend is heavenly. A foodie like me would indeed crave for this. In sync with my temptations, Chef Matteo Arvonio has come all along from Mumbai to JW Marriott, Bengaluru premises. Nothing can beat a Saturday dinner, feasting on Italian delicacies. We reached Alba around 6’O clock in the evening. As usual, an everlasting enthusiastic ambience extended a warm welcome to us. The gauzy chandeliers, apt lighting, incredible presentation of the dishes added to the ambience. It was all set for the Master class demonstration. I was most excited to meet the chef and explore his creation of unique dishes. The moment just arrived, when chef started off demonstrating Tortelli di Melanzane affumicate e pecorino, e coulis di pomodoro. With a keen eye for every minute detail, chef carefully blended the ingredients required for the cuisine. 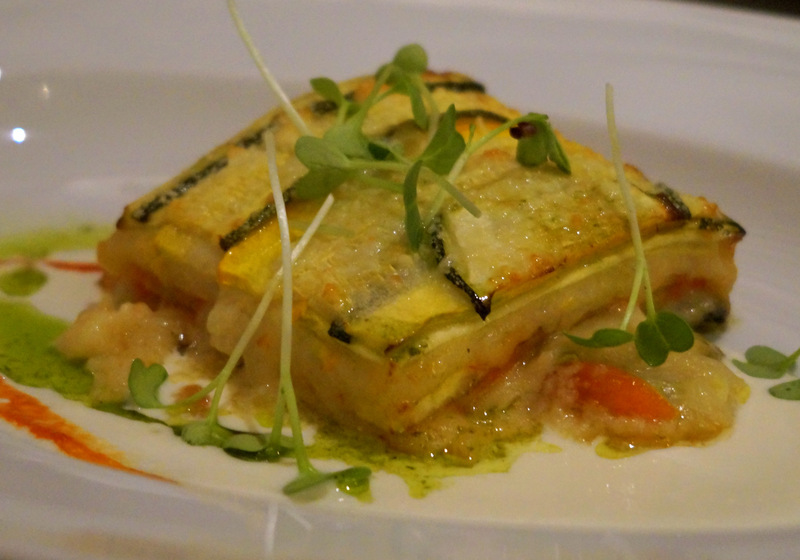 Pecorino ravioli blended with smoked eggplant was stuffed into pastery sheet and folded into pyramid. It was boiled to get the desired texture and taste. Being a perfectionist, soon after preparation, he presented it colorfully to appeal our eyeballs before the palate. Indeed it was a great demonstration, as he explained every step in detail. We were engrossed through the demonstration. Asparagus – A sautéed Asparagus with Heirloom Tomatoes & some exotic Italian veggies with mild seasoning. It’s a much needed to kick start the 4 course dinner. Tortelli di Melanzane affumicate e pecorino, e coulis di pomodoro – During the Master Class, we were totally impressed with the way Ravioli was prepared and Presented. It tastes divine! That’s smoked flavored Egg Plant certainly suits every Indian Palate. Chef Matteo Arvonio Understood the Indian Palate accurately and curated this dish. We were overwhelmed with the Presentation of the dish as well. Parmigiana Leggera di Zucchine, Pesto e Prorola vu Salsa alla Burrata – Being a Lasagna lover, this looks similar to Lasagna and tastes extraordinary because of the Zucchini, Tomatoes, Egg Plant, lots of cheese and garnished with Micro Greens. This was finely crafted & baked with perfection! Cassata Ghiacciata – Does anyone say no to Ice Cream? Most of us don’t know that Cassata has come from a place called Palermo and other areas of Sicily, Italy. The Cassata with a Tropical Twist being served at Alba was mind blowing and must recommended. The Portion looks small. However, it’s too filling. It was a fruitful evening with these wonderful authentic dishes from Sicily. Well, Chef Matteo Arvonio is another down to earth personality and knows his stuff. He has 23 years of experience at Hotels like Four Seasons Hotel in Shanghai, Doha, Maldives and Mumbai; Grand Hotel San Pietro in Italy, Restaurant ‘Emporio Armani Café’ in Munich and also luxury hotels in London, Denmark and Switzerland. I would like to thank Chef. Matteo Arvonio & Simonti Majumdar for having us for such a nice Master Class & scrumptious Italian Dinner. We were truly honored! Note: The Special Menu designed by Chef. Matteo Arvonio is available after 7pm till 27th April 2016. Previous Post New Menu launch & Culinary Masterclass with Chef Shaun Kenworthy at Mustard & Cress,153 Biere Street, Whitefield, Bangalore.